To us, the responsible use of energy means striving to reduce energy consumption as much as possible. Consequently, we encourage sustainable energy generation methods best suited to our airport. We also purchase 100% Dutch, sustainably generated energy. We are applying small-scale heat and cold storage in the soil and in concrete building structures in various locations. Two small wind turbines are installed on the Panorama Terrace. Also, together with local farmers, businesses and various public authorities we are examining which crops are unattractive to birds and can be used as biomass. We pursue active policies to reduce emissions for the sake of a sustainable future. We are continually investing in the sustainability of our own business operations and stimulate our partners to do the same. The ultimate result is a positive impact on your surroundings. From 2012 onwards we have been ACI ACA 3+ accredited; this is the highest ‘neutrality’ status. Check out the infographic to see which types of emissions there are at an airport. 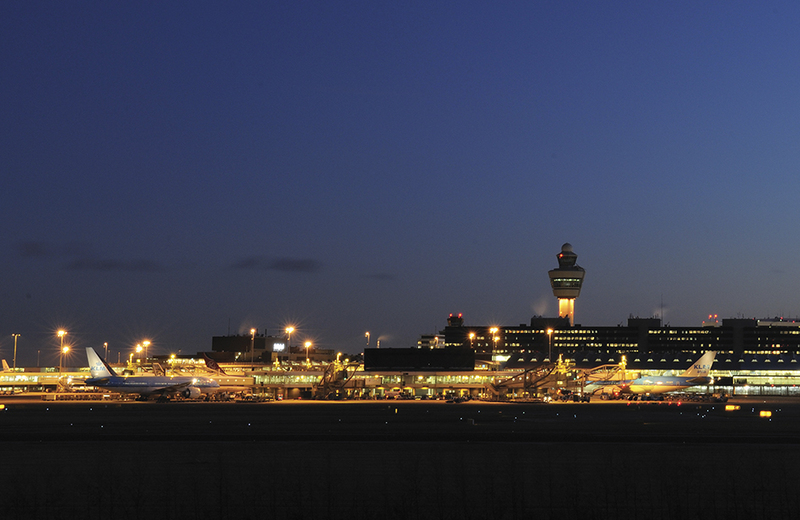 Anyone looking at Schiphol from a distance at night can see that it takes a lot of energy to keep a modern city like Schiphol running 24 hours a day. Using energy as efficiently as possible is quite a challenge. Still, we adapt dozens of measures each year in order to do so. From 1 January 2018, Amsterdam Airport Schiphol has been running on 100% wind power generated by energy company Eneco right here in the Netherlands. We purchase renewable energy jointly with three regional Dutch airports. And because our business partners purchase their electricity from Royal Schiphol Group, we are also making their energy supply more sustainable. Piers B, E, F and G all have a thermal energy storage system. As a result, Schiphol uses significantly less gas for heating and cooling the piers. The Hilton Hotel, Terminal 3 and various office buildings also have access to modern thermal energy storage, complete with heat pumps and dry coolers.